Cats are cute. Lovable. Finicky. Annoying. Charming. Coy. Cuddly. Playful. Mean, Friendly. And Harbingers of Death?? In one Rhode Island nursing home that's the case. It is common practice for nursing homes to have pets around. Aside from being therapeutic, they bring warmth and life to an otherwise sterile environment. The Steere House Nursing and Rehabilitation Centre in Providence has six cats, some parakeets and a rabbit. One of the cats, Oscar, has been living there for two years, and has an interesting quirk. He sits with patients who are mere hours away from death. In his time there, he has attended more than 25 deaths. These patients are in the final stages of Alzheimer's, Parkinson's, and various other terminal conditions. As they near death, Oscar comes into their room, and sits with them until they expire. According to the staff, Oscar is extremely accurate. So much so, that when he starts a new vigil, the staff contacts the family to tell them that the end is near. While some families are spooked by him. Others find his presence comforting. Particularly if their loved one was a pet lover. I happened to mention this story when I was home last week to my sister. She is an aquatic therapist at a retirement center in North Carolina. She said that they have a cat there that does the same thing. His name is Smokey. And he is just as accurate as Oscar. Although, she said there was one time, he threw them for a loop. 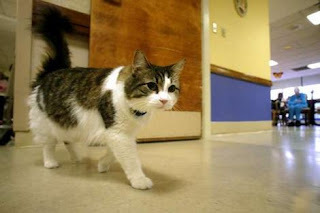 Smokey had made his permanent home in one of the patients' rooms. That patient was not terminal, Smokey just liked it there. Then, one day he moved rooms. The staff thought that meant that the resident in that new room was soon going to go. Well, a few days passed and nothing happened. It tuned out that Smokey was just relocating his own home. Although, I imagine the sudden presence of death cat at this patients door did not do much for his health. So, the question is, how does Oscar know? Did he go to Cat Medical School? That would be a very adorable university, but the answer may be simpler. The best theory revolves around the animal's sense of smell. As a patient nears death, there may be a change in his or her metabolism that the cat can detect. A friend of mine is an EMT in New York. He once told me that he could sometimes diagnose a patient's condition by their smell. If they smelled like chlorine, or a swimming pool, that usually meant diabetes. While smelling drunk, but not being drunk, could mean heart disease. So, considering that cats have a sense of smell equal to dogs, it's fair to say that Oscar smells a change in these patients and that's how he knows. But, that doesn't answer the question "Why?" It seems that animal instinct would tell them to stay away from death. And yet, there goes Oscar and Smokey, right to their side. My personal theory is that it is out of love and compassion. Any cat owner will tell you that cats don't really stay with us for food or shelter. Sure, that's a nice perk. But, cats are natural hunters, and left to their own devices, they would do just fine. It's companionship they want. A lap to curl up in. Someone to play with. A friendly hand to rub their bellies. Or just another presence in the room to watch them sleep. On some level Oscar and Smokey are letting these people know that they are not alone. That they are loved. And reminding the rest of us why we have these wonderful creatures in our lives. I saw that story and after hearing the details I thought the title "Death Cat" was typical media hype. I agree with you that old Oscar is actually a comfort cat who's there so the folks won't be alone.